(from The New York Times (Nytimes.com), October 20, 2013) While CD sales have been declining over the last decade, the first yearly decline of downloads is making music executives turn to streaming service as the possible cause. Currently track downloads are down 4 percent from the same time last year and album downloads are up 2 percent, according to the tracking service Nielsen Soundscan. 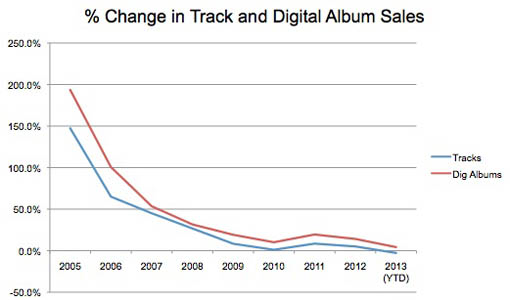 Combining the two results and using the industry’s standard of 10 tracks per album means total digital sales are down nearly 1 percent. While downloads had double-digit growth following the opening of iTunes in 2003, sales have been steadily declining for several years. However, the increased rate of decline this year has been unexpected. While many disagree about what is causing the decline, some turn to streaming services such as Pandora and Spotify. These services give consumers millions of songs available for free or a small fee each month. However, streaming’s effect on sales is still being heavily debated. “We just don’t know that consumers are abandoning one to go to the other,” said David Bakula, a senior analyst at Nielsen. Yet as downloads continue to decline, many in the industry say the growing income from streaming may help produce positive results for the music industry. Last year streaming and subscription services generated $1.03 billion in revenue, an increase of 59 percent from the year before. Some within the industry also say the rise of Android devices is a possible cause for the decline in downloads. While Android phones dominate in sales, iTunes remains the leading music retailer. According to the NPD group, a market research firm, only 30 percent of Android users are likely to buy music compared to 54 percent of iPhone users. However, no publicly available sales data supports this foundation.